These supersalmon traveled over 1,000 miles upstream to spawn in the headwaters of the Columbia River north of the Canadian border in southeastern British Columbia. 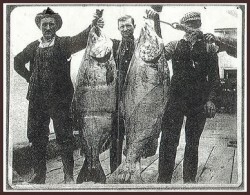 Pictures of huge fish taken in the early part of the 20th century near the mouth of the river in Astoria, OR lend credence to the legend. 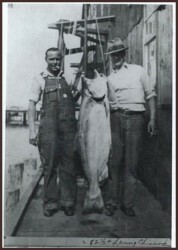 This picture was taken at the Union Fisherman’s Dock in Astoria, Oregon in about 1910. 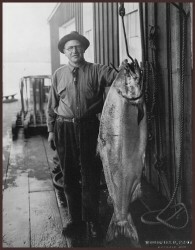 Left to right – Salmon weighs 116 and 121 lbs. They were salted down on 100 lb barrels and sent to Europe on sailing ships. In 1933 the federal government started construction of the Grand Coulee Dam in northern Washington State. By 1938 the dam was high enough to block all fish passage upstream. Unfortunately the U.S. Bureau of Reclamation and the Army Corps of Engineers built Grand Coulee without fish ladders. According to some accounts, dam workers actually watched the giant June Hogs repeatedly smash headfirst into the massive concrete wall. The following year in 1939 Rock Island Dam downstream of Grand Coulee also blocked fish passage, and the June Hogs were effectively eliminated. Almost 600 miles of river above Rock Island and Grand Coulee were lost to the migrating salmon. The Grand Coulee’s 550 foot high wall was finished in 1941 and became the the largest concrete structure in the United States. At the time, thoughts of fish passage were very low on the priority list as hydropower and irrigation gains from the dams were considered most important. Today the June Hogs are still revered among Columbia River salmon anglers even if there are no true specimens left. In 2002 a summer chinook fishing season was finally reopened to anglers after a 29 year hiatus. Today the run is considered healthy and not listed under the federal Endangered Species Act. This year a large return of 88,800 summer chinook is predicted to enter the Columbia River. 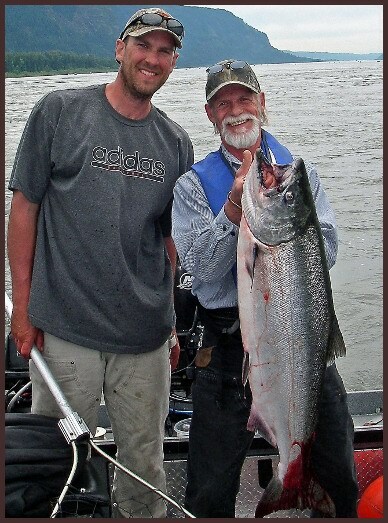 Today the average size of a Columbia River summer chinook is just under 20 pounds with 30 pounders not uncommon. Today’s Columbia River summer chinook are destined for the spawning tributaries of the Wenatchee, Methow, and Okanogan rivers in northern Washington. In 2012 the new Chief Joseph hatchery is scheduled to open and will be stocked with only wild summer chinook from 2012 to 2015, according to the Washington Dept. of Fish and Wildlife. This entry was posted on Sunday, May 23rd, 2010 at 6:13 pm	and is filed under Photography, Salmon Fishing, Sky's News, Stories. You can follow any responses to this entry through the RSS 2.0 feed. You can leave a response, or trackback from your own site.